Mr John Walden was born on 27 December, l891 at 'The Red Lion', Caythorpe which was, at that time, kept by his parents. His interest in bells began on a school outing to Cleethorpes when he heard the bells of St James' Grimsby (then a ring of eight) ringing whilst the train was waiting in the station. One Sunday evening in 1905 he was sitting on a stile at the back of 'The Red Lion' waiting for Caythorpe bells to start ringing for Evensong when Fred and Percy Stokes saw him and took him along to watch the ringing. His enthusiasm encouraged them to teach him to ring and he joined the Lincoln Diocesan Guild in the following year. There was a good band at Caythorpe in those days ringing mainly Stedman but occasionally progressing as far as Double Norwich. As was often the case in those days beginners did not get an opportunity for method ringing unless one of the regular ringers was absent. On leaving School Mr Walden became an apprentice at the engineering firm of Robey & Co in Lincoln. He gained experience in method ringing by attending practices at the Lincoln towers of St Peter at Arches (8) and St Peter at Gowts (6) and also at Washingborough (8). He joined the band at St Peter at Arches and in 1919 he was elected a member of the Cathedral Company of Ringers. At that time two names were submitted to the Dean and Chapter who made the se1ection. Once elected, members were expected to be present on all ringing occasions or find a substitute. They were also expected to be ready in the ringing chamber to start on time. If a member was late or absent he was fined. Ringing at the Cathedral at that time tended to be a closed shop and visitors even from other City towers were barely tolerated. 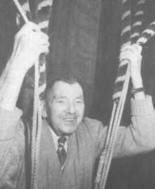 Ringing consisted mainly of Stedman but when the late Mr John A Freeman became Master in 1929 other methods were introduced and the standard of 12 bell ringing was particularly high. The band led by William Pye visited Surfleet annually in September and Mr Walden and Mr Freeman were invited to join them. Mr Walden remembers the high standard of ringing particularly in the placing of the small bells, an important but difficult aspect of 12 bell ringing. Mr Walden remembers William Pye as rather a rough diamond who did all the talking! With the Pye band once the ringers entered the ringing chamber nothing else mattered but the ringing and the standard, particularly in setting and maintaining a rhythm, was superb. Mr Walden told the present writer that he felt that this respect for standards was not always adhered to nowadays. Bob Pye was quieter than his brother but a very competent ringer. Other ringers who came to Surfleet with whom John rang were Jim Bennett, Tom and Bert Coles, Harold Poole and Albert Walker. Mr Walden was very pleased and proud that he had the opportunity together with Mr Freeman of ringing with these past personalities of the Exercise. On one occasion whilst waiting to start a peal at Surfleet William Pye suggested that they ring a touch of Spliced Surprise Major and sparked off Mr Freeman's lifelong interest in Spliced which culminated in the short-lived record peal in 32 methods. Mr Walden was a capable change ringer on all numbers of bells and took part in many 'firsts' for the Lincoln Guild including: Superlative Surprise Royal, Cambridge Surprise Maximus � the first peal on 12 bells for the Guild � Stedman and Grandsire Cinques, London Surprise Major and Spliced Surprise Major in four, six and ten methods. He was a member of the band which rang the first peals of Spliced Surprise Major in 16 and 22 methods and in 1947 took part in the then record length of London Surprise Major: 14,144 changes rung in 8 hours 25 minutes. It is a mark of his ability that throughout that long day he did not make a single mistake and was the only member of the band to achieve this. Mr Walden and Mr Freeman became close friends and when Mr Freeman died in 1961 he was elected to his place as Master of the Cathedral Company � a post which he held until he decided to retire in 1971. He continued peal ringing on a fairly regular basis until his 81st year by which time he had rung 500 peals. In that year he rang in a peal of 5900 Stedman Cinques, rung in more than four hours to mark the 9th centenary of Lincoln Cathedral and intimated that this aspect of his ringing career was at an end. Most people. at the age of 80 would have rested on their laurels but he continued to ring for services and practices at the Cathedral, was seen regularly at meetings throughout Lincolnshire; attended the Veterans' Meeting in London in 1981; and the following year, aged 91, attended for the first and only time the College Youths dinner. So far as anyone knew peal ringing no longer had any appeal for him. Then, when asked if he wished to attempt a quarter peal at the Cathedral to celebrate his 90th birthday, he said that he would rather attempt a peal! So he and seven other members of the Cathedral Company rang a peal of Stedman Triples on the light octave in St Hugh's tower. This was followed by peals of Stedman Triples on his 91st and 92nd birthdays and after the latter he announced to his colleagues that that was definitely his last peal. A statement to this effect also appeared in the Lincolnshire Echo for, by this time, he had become something of a local celebrity. It was to be expected that by ringing peals at such a great age he would become something of a legend among Lincolnshire ringers. However, when his 90th birthday peal was reported in the local press others began to take an interest in him: he was interviewed on Radio Lincolnshire; the BBC television programme "Look North" made a feature of his attending practices; and when in 1984, "Songs of Praise" was televised from Lincoln Cathedral, the service was heralded by the sound of the bells and a close-up of him ringing. All this revealed an unsuspected talent in him - he was a 'natural' before the microphone and the television camera. He was never overawed and never at a loss for words. This publicity created a surprising interest among the general public in and around Lincoln. Mention of the Cathedral bells prompted many to ask if the nonagenarian was still ringing and how he was faring. This interest in his well-being mirrored that shown by ringers of every age who sought him out wherever he went. It was due to the fact that whether on television or face-to-face he appeared as he was - a gentle man always kind and appreciative and one who thought ill of no man. He went into hospital a few weeks before Christmas 1985 for an operation from which, at first he appeared to recover well but, eventually his great age took its toll and he died in St Georges Hospital, Lincoln on 8 February 1986. Mr Walden once told the present writer that the peal he was most proud of was the first on the 12 at the Cathedral which was of Cambridge Maximus conducted by the Revd H Law James. This was rung in 1929 after three failures with Mr Walden on the treble after which he was moved to the eleventh and the peal was successful! He will be remembered for his dedication and skill as a ringer but equally so for his generosity of character which made his company a constant joy.